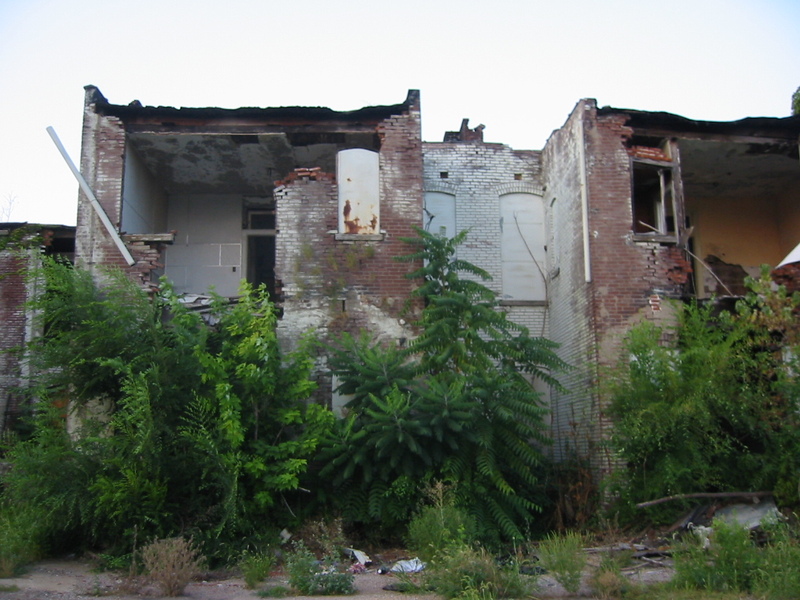 Recently one of my readers commented about how negative most blog posts regarding the built environment are here in the Lou, and that sometimes its nice to see something positive. 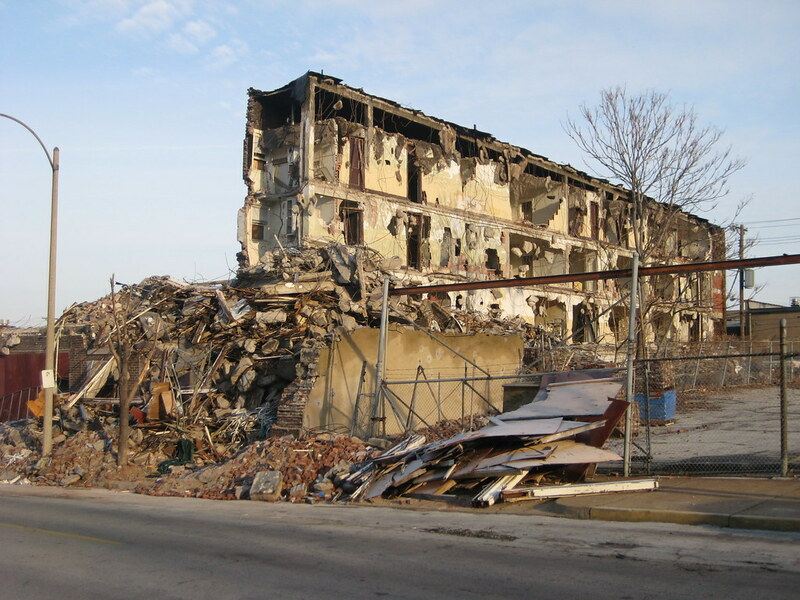 I have been told by more than one reader that Vanishing STL is the most depressing blog. I actually take that as a compliment, because seeing St. Louis' architectural heritage squandered and destroyed as often as it occurs around here angers me and sometimes depresses the hell out of me... so I make it a point to post about these acts of insanity to inform others of what is occurring, or as is the case with some posts, what occurred many years ago. 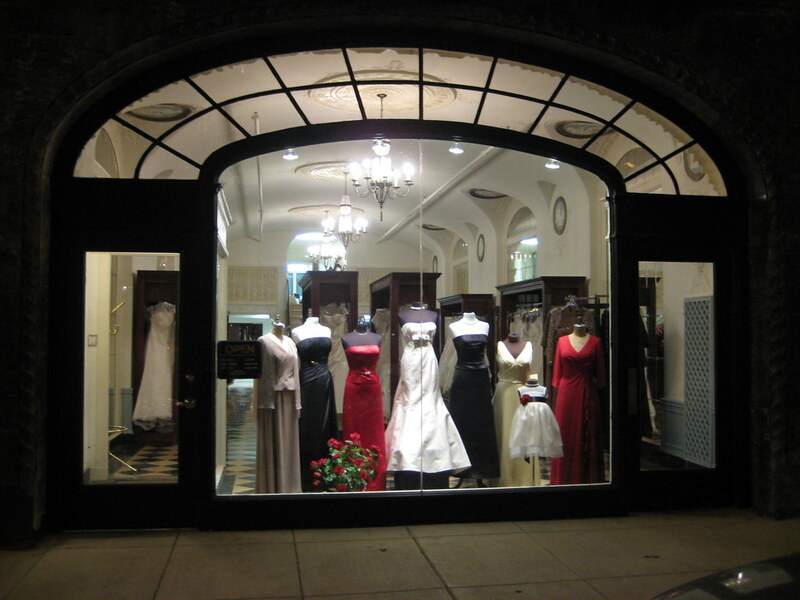 This beautiful bridal dress shop opened just last week in the former Ludwig Aeolian Building at 1004 Olive. 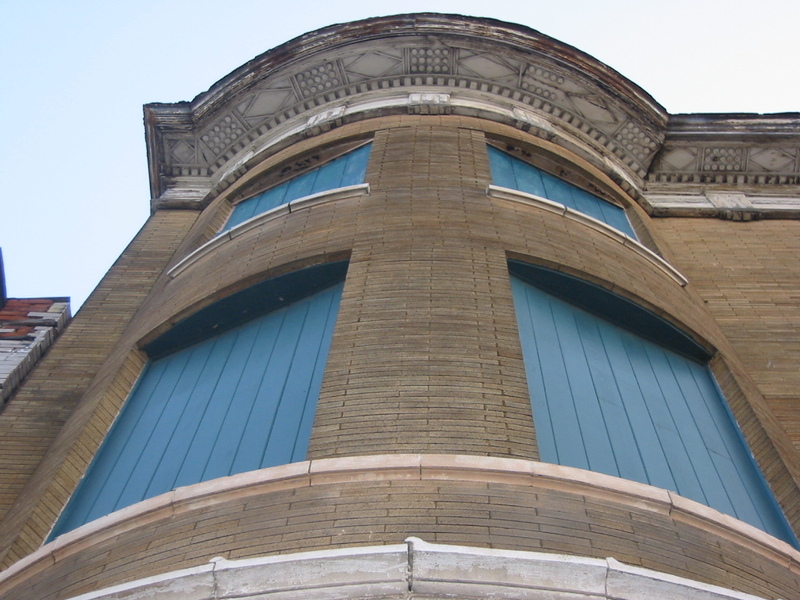 One of the buildings that been lingering for a while, the Ludwig Lofts has now almost been completed by LoftWorks. 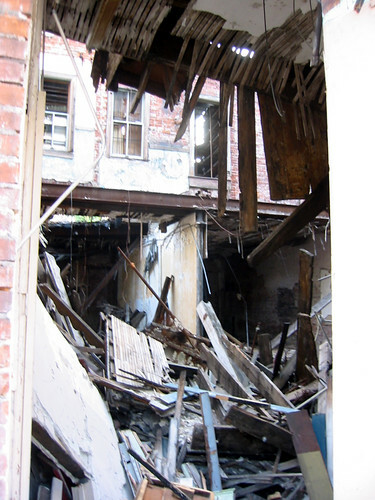 When I first entered the building about seven years ago, the roof was collapsing around one of the original skylights. To deal with the breach, the buildings former owner rigged up quite a contraption of a drainage system involving a blue tarp held up by some old desks and other odds and ends laying around and funneling into a piece of 4" PVC that was piped out a back window. This contraption actually did a pretty decent job of keeping the building dry. This scene of several Christmas trees and lights in the windows of the Vangard Lofts caught my eye on the way back to the Globe Building garage a few days ago and made me think of how far we have come in the last several years. With that I leave you until next year... Happy Holidays! 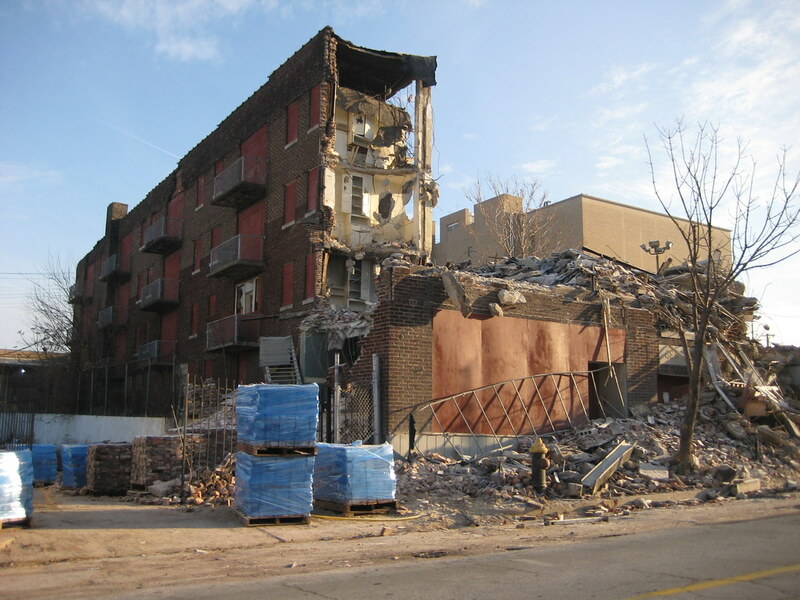 Demolition of the Central Apartments at 3727 Olive began late November / early December. For the first (and last) time in several years, the storefronts at the first floor of the building were revealed from behind the plywood barricade that had been erected to block the sidewalk so that pedestrians don't get hit by falling brick. Apparently when the entire building comes crashing down on the sidewalk during demolition, no protection is needed. 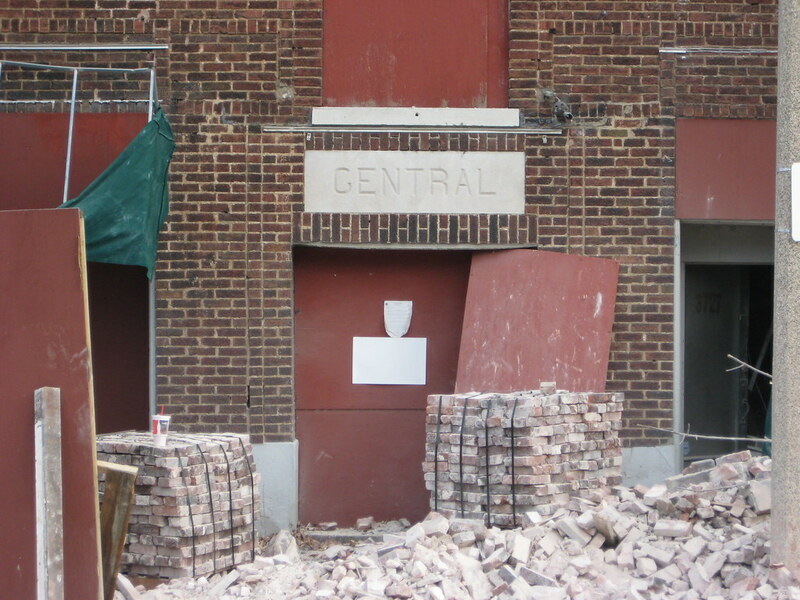 By mid-December most of the front wing of the T-shaped building is gone except for building entrance and west storefront, and only the west half of the main portion of the building remains. From this angle it is easy to see that the concrete frame, floors and roof slab of the building was in fine structural condition. 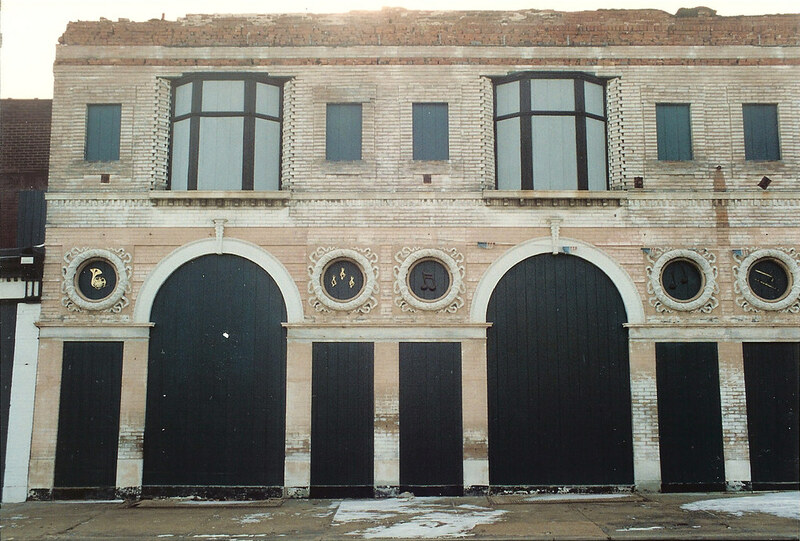 Only the exterior brick skin of the building, which was peeling away in several places was in need of serious repair, meaning that the building as a whole was definitely rehab-able. 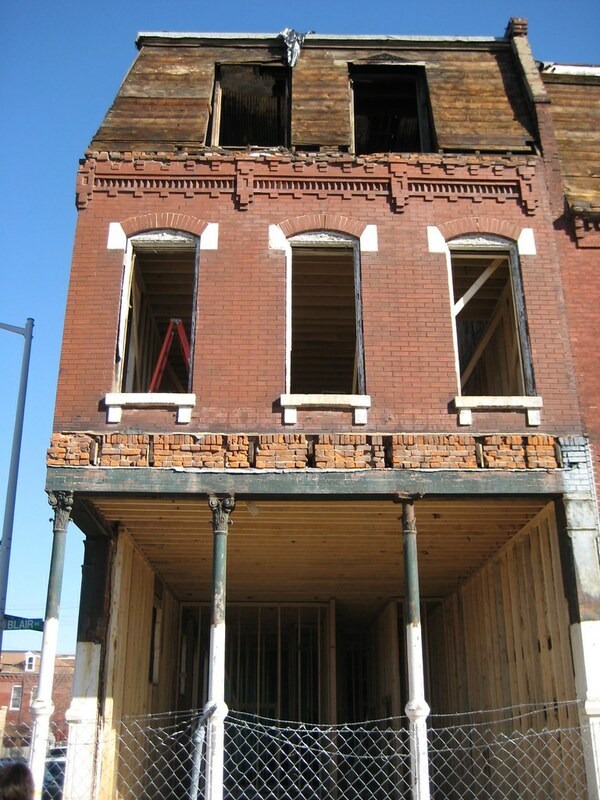 Demolition revealed that the upper floor contained a large attic space above the plaster ceiling that increased in height toward the front of the building due to the roof slope, which could have provided very loft like spaces for units on this floor. 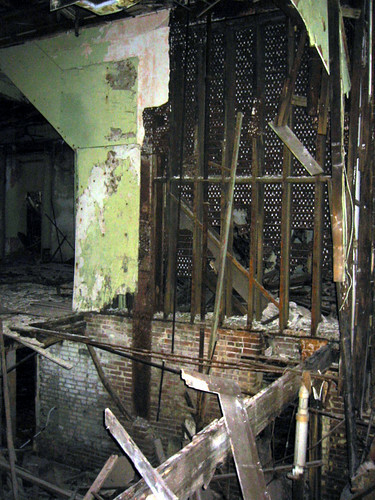 Like most apartments built in the early 20th century, these included built-in cabinets that were still intact as the building came down. 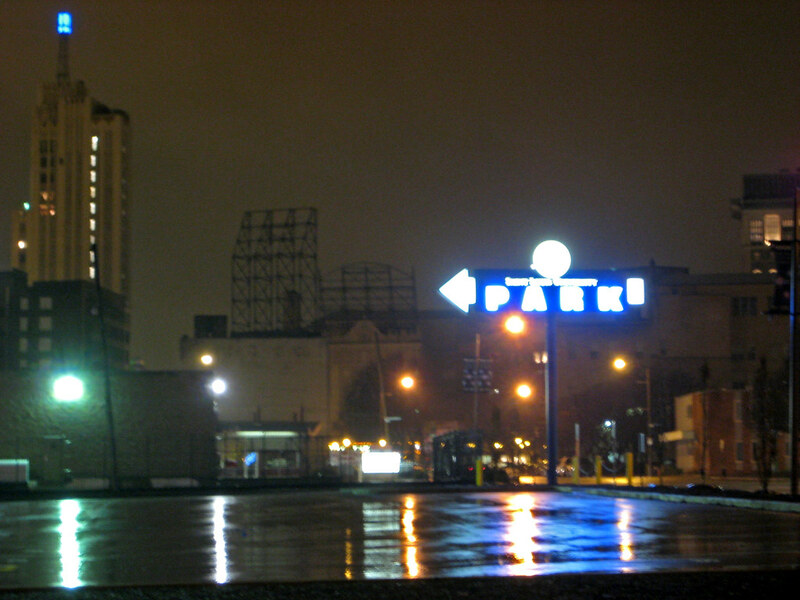 On the east end of Grand Center, where SLU recently cleared several buildings including the Locust Livery Stable, the two new block-wide slabs of asphalt stretching from Locust north to Samuel Shepherd are now marked by large new lighted signs. They appear to be poorly designed knock offs of the attractive neon signs by Kiku Obata that have marked several surface parking lots in Grand Center for about a decade. The originals add a nice bit of kitsch to the still emerging arts district, but these additions by SLU are simply ugly. 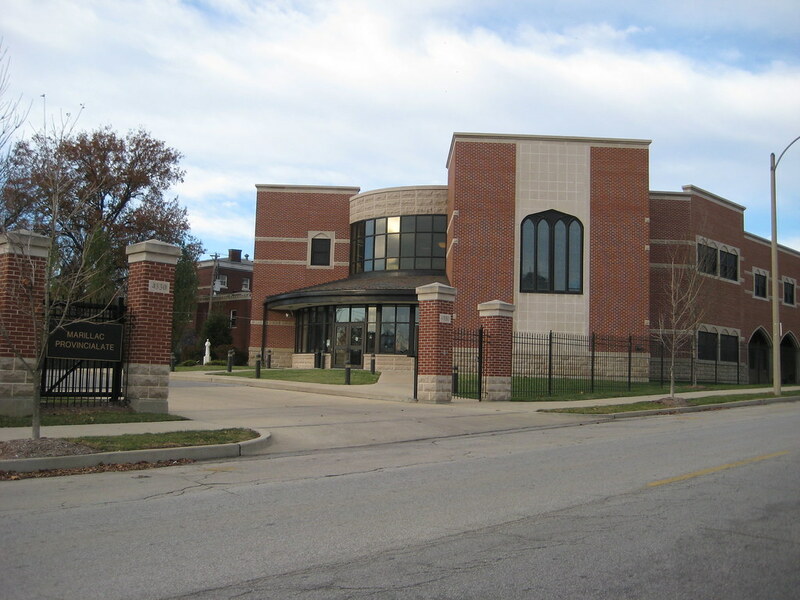 2001 was the beginning of the end for Gaslight Square when a three story building at 4312 Olive was demolished and replaced with a semi-suburban looking office building and fenced parking lot for the Daughters of Charity. 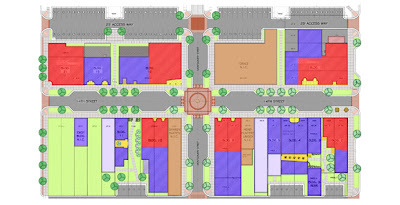 In 2003 Citirama at Gaslight Square was announced, which would bring nine homebuilders to build an entire block of showcase homes open for public tour based on the popular Homarama events that had been held in St. Louis and St. Charles Counties. 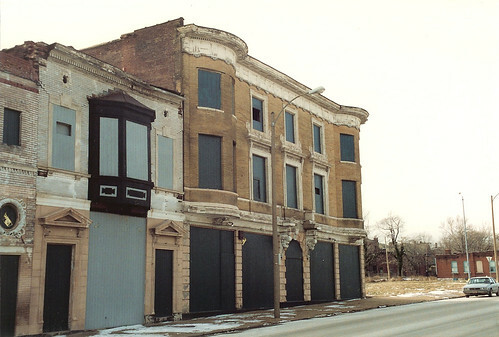 The project brought the demise of the remaining Gaslight Square buildings which were concentrated mostly on the south side of Olive. 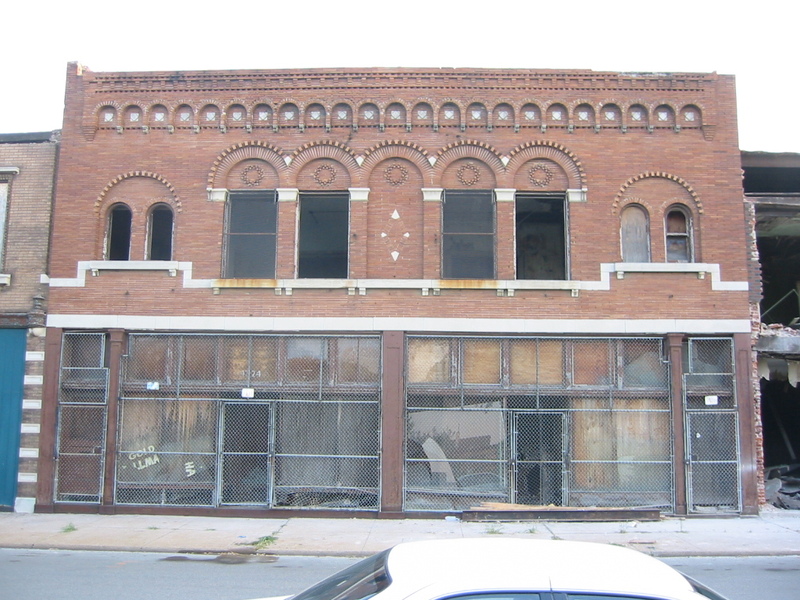 Like the buildings demolished alomst a decade earlier across the street, most had been abandoned by the mid 1970's. Many were owned for some time by a subsidiary of McCormack Baron, whose successful Westminster Place development took form just one block south. 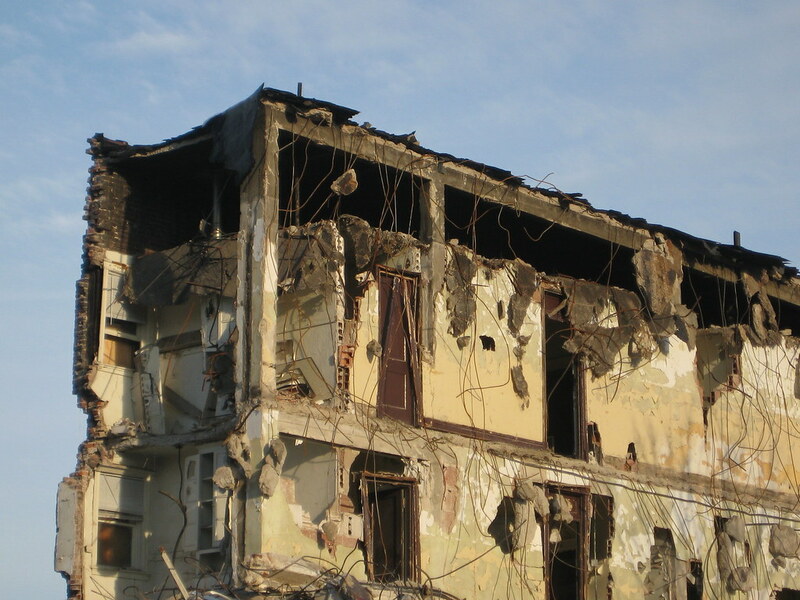 By 2003 they were a textbook case of demolition by neglect with widespread collapse of roofs and floors. 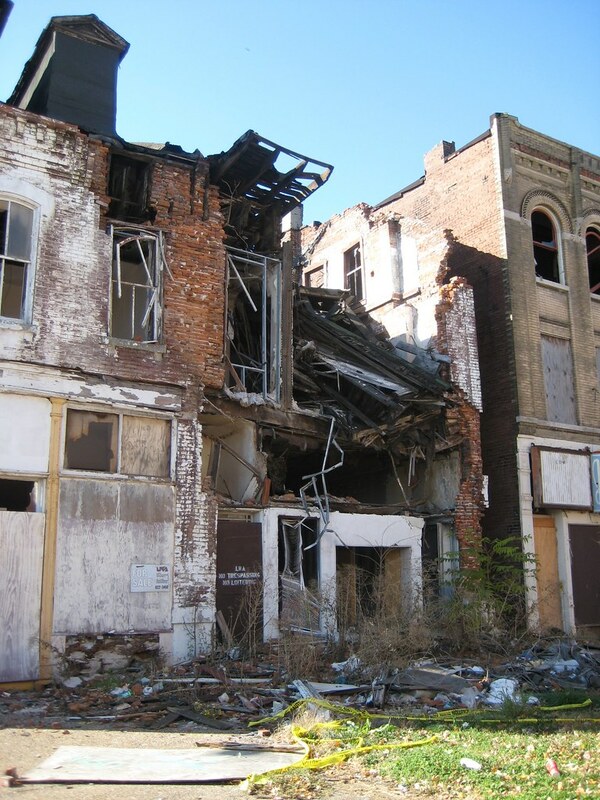 For Citirama, these crumbling buildings would have go, and so would a few that were occupied and were in excellent structural condition. According to an interview with a vice president from the Home Builder's Association, "The concept won't allow for infill, so the site needed to provide the developers control from the ground up. It's a very expensive proposition. It cost one and half million dollars just to clear the area." 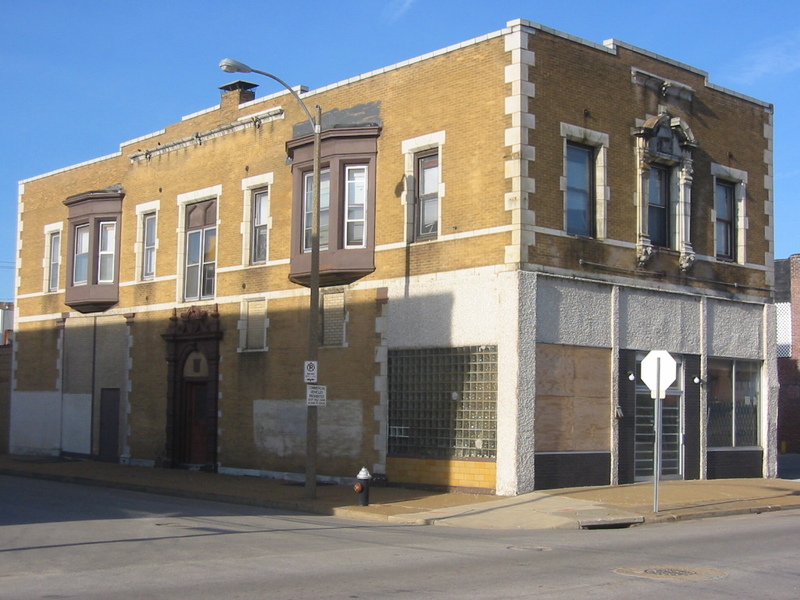 The one exception was the building that formerly housed Selkirk's on the southeast corner of Olive and Whittier. 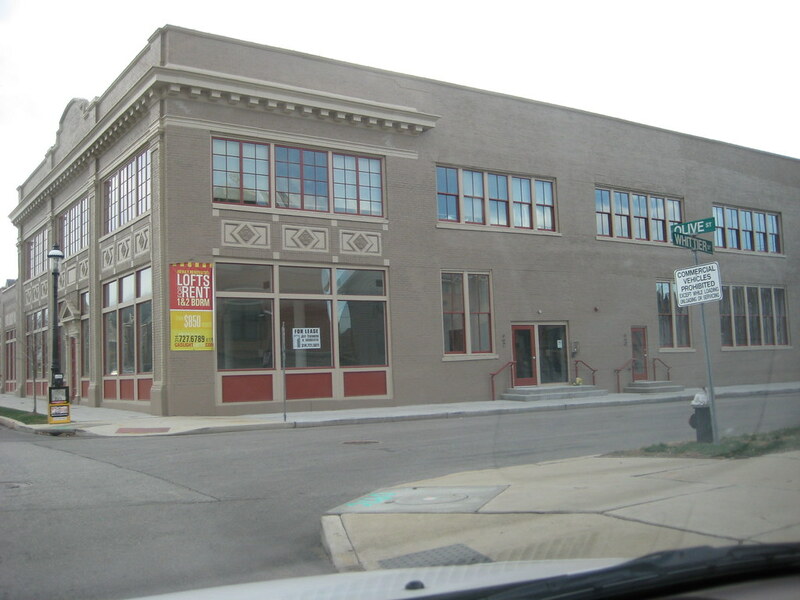 The building was renovated for use as a restaurant or retail with loft apartments on the second floor. Citirama was an extremely successful project, and I'm thrilled that several home builders new to the City were attracted to build. The density is also pretty decent, when compared to many other "new home" developments in the City, with over 50 units per block. I just wish that Citirama would have allowed for creative re-use of more of the remaining buildings. So what could the old Gaslight Square have become? 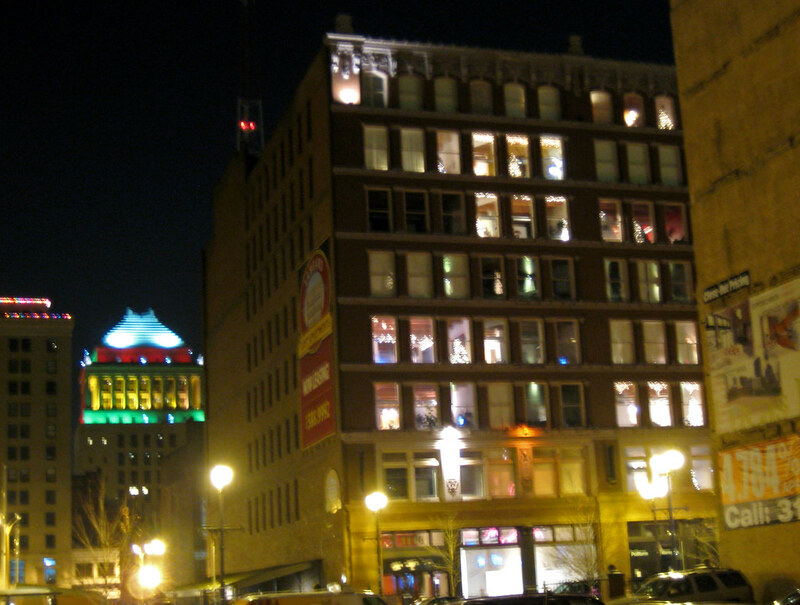 With the popularity today of the Loop and Soulard, the emergence of the Grove, a plethora of chain bar/restaurants soon to be built at Ballpark Village, and nearby Grand Center slowly trying to build a nucleus, would St. Louis need another night life district in the form of a revitalized Gaslight Square? Certainly not. What then to do with the old buildings? What is shaping up to become a perfect example of the potential lost at with the demolition of the Gaslight Square is actually under construction, (ok, make that re-construction) right now, the re-generation of the old 14th Street Mall on Old North St. Louis into Crown Square. The new Crown Square will be a mix of commercial spaces with traditional and loft style apartments above as well as live-work units opening directly onto the street. The buildings of Crown Square are similarly scaled and ironically have been abandoned for about the same period of time as those of Gaslight Square prior to its clearance. 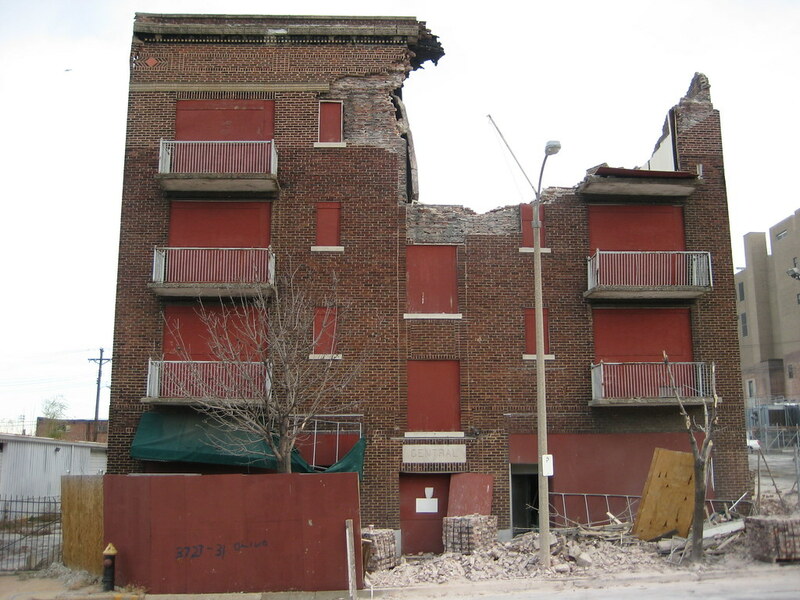 Many of the buildings are at the point where most developers would simply give up and start over. At Old North, though, the exact opposite is occurring. 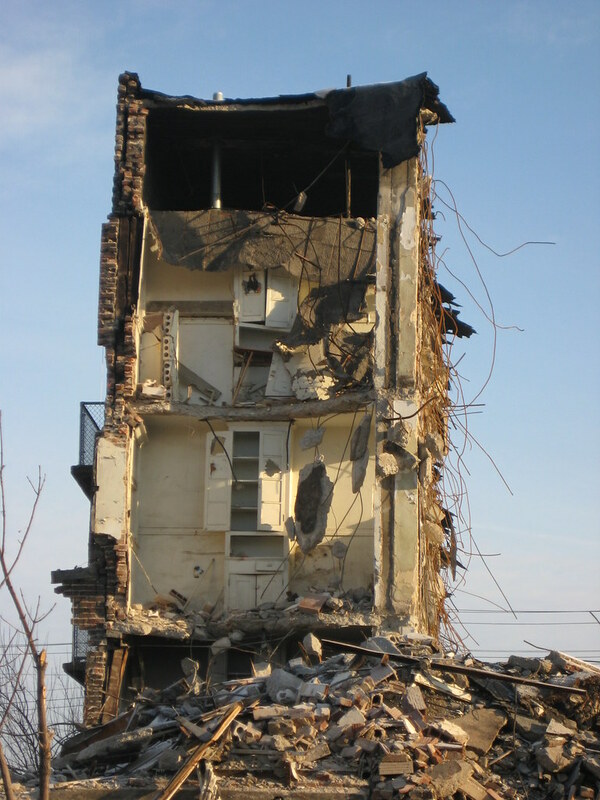 At Crown Square, there is no demolition occurring. 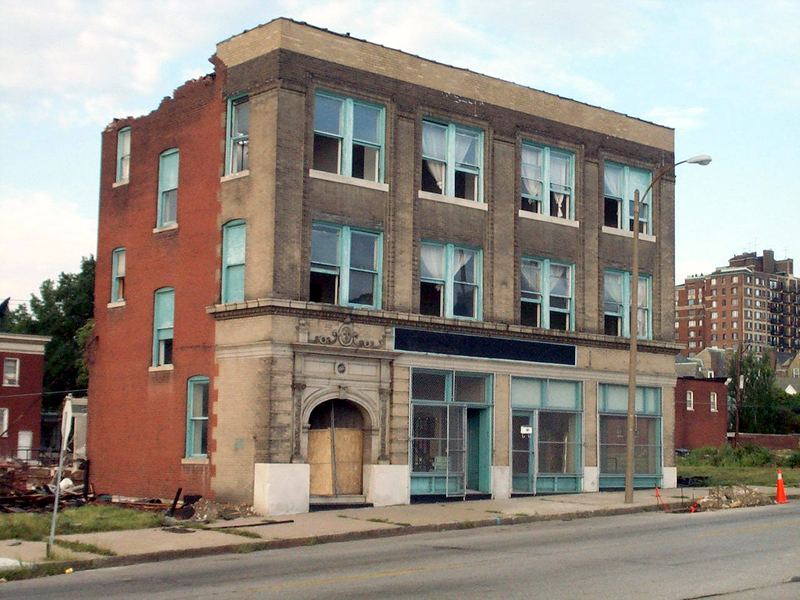 Every existing building, even a little "fixer-upper" that is literally collapsing at both the front and back, is being rehabbed. All of this is being done not a block away from the million dollar mini-mansions of Fullerton's Westminster Place (where Gaslight Square was located) but in the middle of a neighborhood surrounded by almost complete devestaton in all directions. The new townhomes where Gaslight Square was located are regularly selling for $400,000 and up, so if the Old North Restoration Group can make the economics of preservation work, there is no question that the same could have been done at Gaslight Square. Back on Olive just west of the new Gaslight Square, completed just this year, is another example of what could have occured as part of the larger re-development. 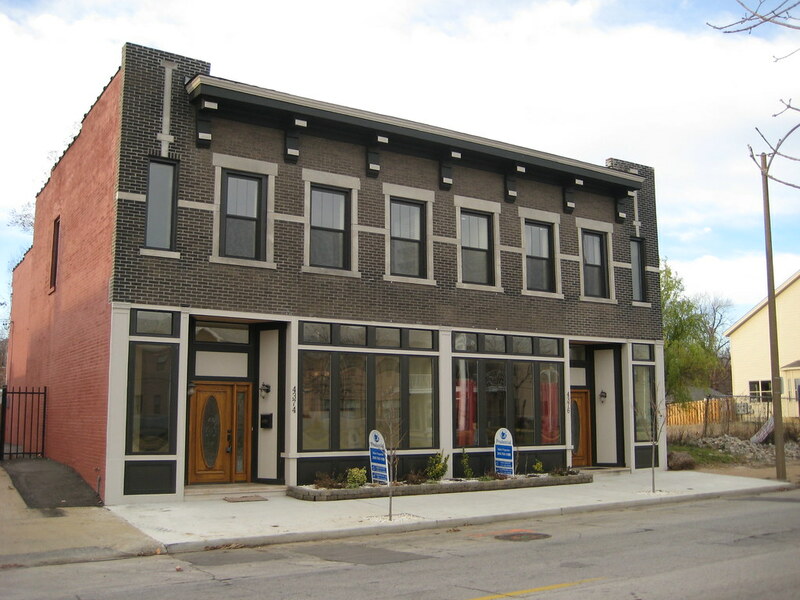 An empty two story storefront building at 4374-76 Olive has been converted into two 2,700 s.f. townhomes that are currently on the market by Prudential Real Estate for $354,900 each. 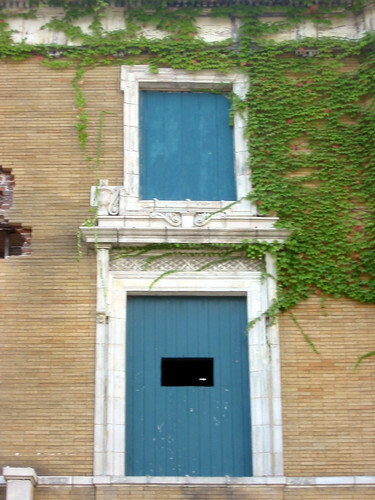 While it is clear that there was little hope of ever bringing nightlife back to the Square, preserving the buildings with a mix of commercial, residential, and live/work spaces would have at least offered the opportunity for some day-time life, as well as a glimpse of what had happened there in the past, but ultimatly, with the almost clean slate "urban renewal" style demolition that occured and the subsequent new construction, Gaslight Square is doomed to live its next several decades as nothing more than a sleepy row of town houses with little memory of its former life.